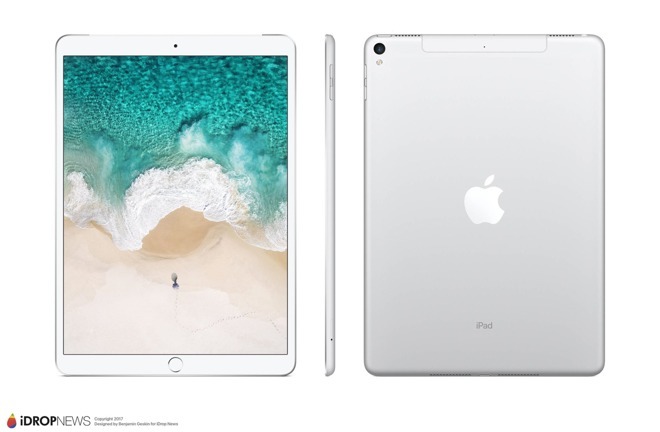 New renders of Apple's rumored 10.5-inch iPad Pro have emerged, and are said to be "100% confirmed" and based off of the blanks reportedly provided to case manufacturers in advance of announcement. The renders, made by Benjamin Geskin and sourced from "sources in China" are generated from and amplify case leaks supplied by the the same source on Monday. Early versions of the mock-ups omitted a home button, but reportedly "blanks" provided to select manufacturers omit that. The renders suggest 7mm side, and 19mm top and bottom bezels. Three microphones adorn the unit, with one on the upper-center of the case, and two on the top. Quad-speaker audio is expected. Overall, the device appears to be about 10.3 inches tall, 7.1 inches wide, and 0.25 inches thick. The 12.9-inch iPad pro is 12 inches tall, 8.68 inches wide, and 0.27 inches thick, with the 9.7-inch iPad Pro coming in at 9.4 inches tall, 6.6 inches wide, and 0.24 inches thick. There is no sign of the smart connector, but as the models provided to favored case manufacturers reportedly don't include home buttons, they likely don't include the Smart Connector either. Despite Geskin's claim of 100 percent confirmation, it remains unclear if the cases and renders represent real-world specifications.